Superman got the colours all wrong. The all-powerful players in the Bundesliga world right now don't wear red and blue, never mind a cape — that would just be impractical on a football pitch where shirt-pulling is already a defender's favourite pastime. In two Bundesliga games against Dortmund, the Colombian craftsman has been BVB's Klassiker Kryptonite, turning in a superhuman pair of performances that would have even the evillest of criminal masterminds purring more than their cats. But there are no gadgets or intergalactic powers in his armoury, no sir. It's only with feet sharper than a Hawkeye arrow and a brain smarter than Tony 'Iron Man' Stark's that James has conjured up one goal and four assists in two Klassikers, overcoming the grand designs of Bayern's black-and-yellow nemesis in stinging 3-1 and 6-0 defeats last season. That comic-book return — from just 149 minutes as he was taken off in both matches (even super(hero)stars need a rest sometimes!) — brought Dortmund to their knees. In Saturday's upcoming Klassiker, you wouldn't bet against the goal-slinging assist artist from saving Bayern and foiling Dortmund's plans to take over the Bundesliga world all over again. There are Klassiker debuts and then there are classic Klassiker debuts. James' bow in the Bundesliga's heavyweight struggle between the league's two superpowers was one to remember, though not for happy reasons for Dortmund fans. Two assists didn’t quite do James’ November 2017 performance justice, because the Colombian did not put a foot wrong. In fact, he put far too many of them right for the liking of the vast majority of the Signal Iduna Park capacity crowd. He took out Marcel Schmelzer for Arjen Robben’s opener with one cushioned piece of control with the chest that smacked of the insolent ease with which the Incredible Hulk flicks away an enemy tank; his laser-sharp vision to spray the ball wide left to David Alaba for Bayern’s second would have been the envy of the X-Men's Cyclops. The sequel is often not as good as the original, but James ensured Dortmund would remember his second tangle with them even more. The Colombian was like Captain (South) America, untouchable and standing tall on the Bundesliga battlefield as he scored one and set up two in a masterclass that saw him excel in a deeper role in which he himself admitted, "you basically make your teammates play". And boy, oh boy, did he?!?! When your supporting cast is as good as James’ that can cause opponents a headache or six as Dortmund found out. He caressed Bayern's second beyond a bamboozled Roman Bürki, and then started the move himself — forcing Gonzalo Castro into surrendering possession — that eventually led to him crossing for Thomas Müller to net the third. His through ball for Franck Ribery to make it 4-0 before the half-time break may not have required the technical brilliance of Batman, but it would surely have earned the praise of Bruce Wayne for its sublime, nonchalant simplicity (and the fictional multi-millionaire-turned-vigilante would probably have enjoyed the Frenchman's magnifique chipped finish too). Episode III: HOLY BUNDESLIGA TITLE RACE, IT'S BACK ON? Just like last season, Bayern have started slowly while Dortmund have charged head first into the fray and — so far — come out on top. 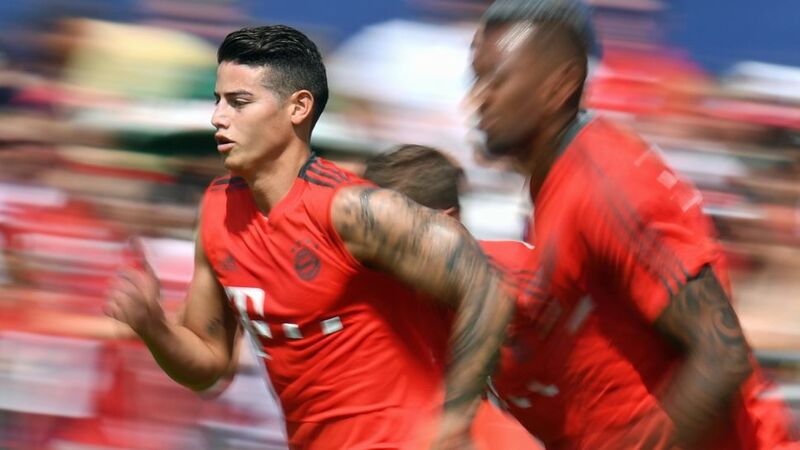 New Bayern boss Niko Kovac has only used James sparingly, giving him eight appearances, only five of which have been starts. James' influence has certainly remained intact with his three goals so far this season all coming in Bayern wins as he has played in the number 10 role that made him a global star. Kept on the bench in the UEFA Champions League win over AEK Athens in midweek, he will be fresh for the Klassiker. Blindingly bad news Dortmund! Will James Rodriguez rush to Bayern's rescue and run rings round a ragged Dortmund again? Can the Colombian create yet another Klassiker K-atastrophe for the Yellow-Blacks? Have Lucien Favre's fantastic league leaders finally met their match?